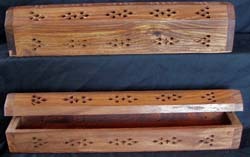 Hand carved cutwork graces the top, front and back are assorted styles with or without brass inlays, simply insert your stick inside the box through the hole and burn your incense. The box is designed to burn with the top open or closed (depending on stick) and has two cone holders. Afterwards, you can open the lid and dispose of the ashes. It has a convenient storage slot in the bottom to store your incense. Box is 12" long and is an easy way to burn sticks and cones. Each box is hand rubbed with teak oil.